CETEM is a non-profit scientific research and training organisation located in the south east of Spain. CETEM was created due to an initiative by private companies from the furniture and woodworking sectors of the Region of Murcia, and established in 1995 with the initial support of the regional government, the Spanish Ministry of Industry and the European Union. CETEM is formed by 30 professionals with different backgrounds: engineering, technology transfer, business administration, chemistry, psychology, teaching, design, etc. The scope of experience actively contributes towards the socio-economic development of companies by providing support and promoting processes of technology, innovation and development, such as strategies of competitiveness in the business environment and training programmes. In spite of having witnessed difficult conditions in 2008, the Spanish furniture market currently supposes 4.6M€ with restoring tendency, representing a 5% of share all around Europe. Besides managing more than 30 Vocational and Educational Training programs per year, covering a wide range of areas from Design, technology transfer, IPR rights, and production management to quality standards, CETEM is involved in many Higher Education initiatives. 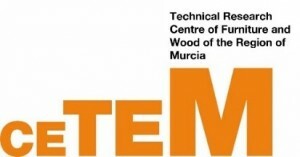 Every year, CETEM, with the University of Murcia, arranges an edition of the Master Degree in Design and Business Management for the Furniture and Woodworking Sectors, which is currently adapted to the European Higher Education Area (EHEA). Throughout the 14 editions of the Master, a total of 220 students have completed the master degree and 80% have been incorporated into the labor market. CETEM departments also actively collaborate with Higher Education institutions in R&D, VET and HE initiatives and participate in workshops, presentations and are frequently part of the dissertation committees of PhD. thesis of different subjects including Industrial management, Environment, Materials, Electronics and Robotics and acting as a conduit between academic institutions and industries. Furthermore CETEM is recognised as a Technological Innovation Centre (CIT Nº 83) and as a Technology Transfer Office (TTO Nº 165). Since 2009 and aligned with the Corporate Social Responsibility (CSR) strategy, CETEM has been working in many initiatives with the aim of identifying and reduce the skills mis-matches in the furniture and woodworking sector addressing students, unemployed, designers and, of course, staff from these industries and stakeholders. The aforementioned Furniture Master Degree and some other initiatives, such as Change-UP, LILAC, VETAAL (www.vetaal.eu), WOODABILITY, WorkingTri21, ARTURE, BEYOND45 and ERGOSIGN are clear examples of how CETEM tries to improve competences, increase levels of skills for employability and entrepreneurship, and to create a better skills understanding and recognition in these sectors. Since 2008, all the initiatives are being managed according to a Research, Development and Innovation System which is certificated according to UNE 166002 R&D&i Management: R&D&i Management System Requirements. In order to manage all project issues, (coordination, deviations, communications, IPR, Internal/External meetings etc.) CETEM has established internal procedures for the correct financial management of any initiative involved. For example, periodically CETEM asks the partners for the amount expended in the different budget categories, towards the monitoring of the global expenditure.